Behind the stark headlines of the Ebola outbreak, which has killed thousands of people in Western Africa, are endless tales of hope and courage as average people do what they can to help others. 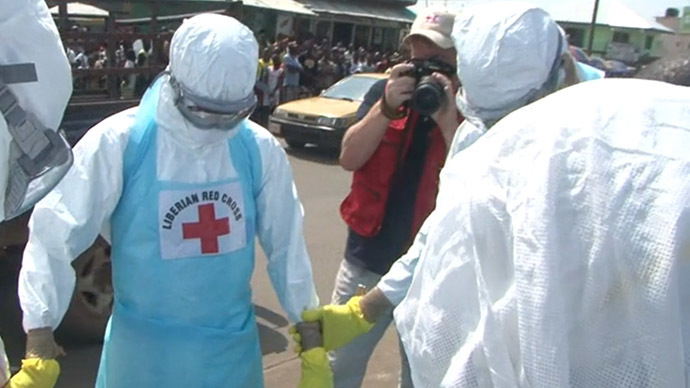 On March 31, 2014, the West African country of Liberia confirmed its first two cases of Ebola. One month later, six people had already succumbed to the deadly disease and dozens more were infected. Some of the fatalities included unsuspecting doctors, who initially thought their patients were suffering from malaria. RT met with members of the Liberian Red Cross, many of them volunteers with little or no previous medical experience who, nevertheless, want to do what they can to help their country in this time of emergency. Malvin, for example, is an artist who used to decorate the tombstones of Ebola victims before the government started cremating the bodies out of safety concerns. As he and several other Red Cross volunteers prepare to remove a body of an Ebola victim from a street in Monrovia, the Liberian capital, Malvin explains that his work is for the living not the dead. Many Africans – either through government public-service messages or their own experiences - have become all-too familiar with the symptoms of the Ebola virus, which include fever, muscle pain and headaches, followed by vomiting and diarrhea. In the final stages of the disease, sufferers experience decreased liver and kidney functions, as well as internal and external bleeding. For the majority of people who contract Ebola the disease proves fatal. The RT correspondent who spent the day with the Liberian Red Cross had an unpleasant surprise when he returned to his quarters in the evening. He discovered that the water supply had been shut off, followed shortly later by the electricity going off. This made disinfecting himself against Ebola an extra challenge. In December, 2014, there were 7,690 reported cases of Ebola infections in Liberia and 3,161 were fatal. Of those who died, 174 were medical workers.